Behind the Mic–Guest John Lies – Welcome to the 2019 Beemie Awards! 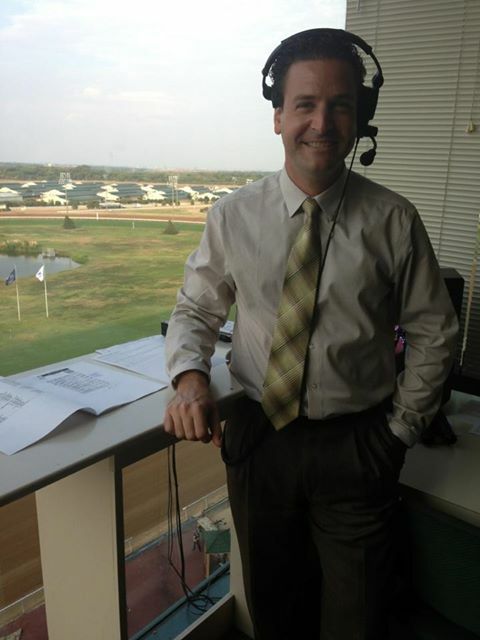 John Lies has been announcing races at Lone Star Park for almost a decade now. A Southern California native he’s worked at Del Mar as the paddock host as well as calling races at the short but amazing Kentucky Downs meeting. JL: My Dad was a small-time trainer in Southern California where I was raised. Some of my earliest memories were on the backstretch and in the roaring grandstands at Hollywood Park and Santa Anita, and I was a fan at a very young age. How did you get into announcing and what do you remember about getting that first job offer? JL: I wanted to be an announcer since age ten or so when I got the opportunity to meet Trevor Denman and spend time with him in the old booth at Del Mar. I didn’t pursue live calls myself until I was 27 mostly because of my interest in training, which I abandoned at about 25. I was offered the job at Lone Star Park at age 28 off very little experience. I remember feeling a mix of about 80 percent excitement and 20 percent apprehension, based mostly on the fact I had never lived anywhere outside Southern California before including having gone to college there and would have to face the reality of hitting the road to become an announcer. We all remember our first race call, tell me about yours? JL: My first race call was in July 2004 at the Sonoma County Fair in Santa Rosa, CA, an arrangement made possible by their track announcer at the time, Vic Stauffer. It was the last race of the day and televised live on TVG. I was very nervous, increasingly so as the last horses moved into line. My heart was pounding harder than any of theirs. It was hard for me to believe that I was actually up there doing this, a very strange and new feeling. All went well enough considering, but there is nothing like getting that first one out of the way I suppose. You’ve been at Lone Star for nearly a decade now, what have been some of your favorite races and calls since you’ve been there? JL: Game On Dude’s Lone Star Derby is memorable because of what he has accomplished since. There was a turf race for fillies and mares years back where two South American-breds turned for home together on the lead in a line of four, and I remember feeling as though this must be what calling races at the Hippodromo is like as the names “Voz de Colegiala” and “Paz Ciudadana” enjoyed obligatory repetition through the stretch call. And the final win by Wasted Tears over that course was memorable for her dominance and hometown appeal. You’ve worked at Del Mar during the summers, what makes racing there so special to you? JL I grew up there six days a week each summer early as I can remember. There is an association with having met Trevor there, though that was the old building. That’s when the “roar of the crowd” really was a roar because all those people packed into those tiny old grandstands created a noise I had never heard before when the gates opened for the first race on Opening Day. Del Mar is very different today but the last five summers I was able to spend there with my Dad before his passing when traveling back to Del Mar from Texas to work as the simulcast host were very special. Every announcer I’ve met or talked to has memories of Luke Kruytbosch, what are some of your memories of Big Luke? JL: When I was working at the Southern California tracks in my early twenties my buddies and I would make annual pilgrimages to Arizona for spring training each March. Luke was friends with everyone in the group, of course, and we always visited him at Turf Paradise. He was largely responsible for much of the fun had by all on that trip in those days. One year I was getting buried before winning a $600 jackpot on a dice game called Captain’s Ship Crew that Luke set up for us after the races in the backstretch bar. Years later he gave me my very first opportunity to work as an announcer standing in for him at Ellis Park for three days in August 2004. The last year Luke called Kentucky Downs before his passing I was brought on as their paddock host and he asked me if I wanted to call a race one day that season. For some reason I turned him down but now I wish I hadn’t. You announce at Kentucky Downs, which is without a doubt the most unique track in the country. Tell us about the track and about how tricky calling races there is? JL: The 1-1/2-mile course runs quickly by the stands the first time into a sharp first turn, wanders up a gradual hill and to the right to “the crest of the rise” (a Luke term) where our view is then of horses running down and away. Then they dip and bank left for the long, sweeping final turn. When they straighten away the horses appear from the stands to be running almost straight at you and still have over a quarter of a mile to go, then the course will undulate in deeper stretch. It does present a number of obvious challenges for the announcer, not to mention the riders, plus I am low and out in the elements. But just like that first call, it just takes doing it and getting comfortable. I wish they had more days. As a handicapper, what’s one of your most memorable selections or hits at the windows? JL: Have never been afraid to step up to the window on races I don’t call, but I would have to leave horses my Dad trained or I was otherwise involved with out of it to qualify it as a true handicapping score. A memorable selection was Animal Kingdom in the Kentucky Derby because I gave him out at Lone Star and several people I know that never bet said they cashed because I picked him. And I seem to remember my close calls and bad beats at the windows much more readily than the ones that worked out. Isn’t that awful? I will say that I am a fan of the 50-cent Pick Five because of the low takeout and have had some success but wish they would move it to the last five races of the day instead of the first five to get larger fields and producer bigger payoffs. Who are some of your influences as announcers? Any guys you really like listening to call? JL: As I have heard you say in so many words, announcers are like ice cream flavors and everyone has his favorite. That’s why there are 31 in the shop. For my taste, Trevor Denman is in one race and the rest are in another. JL: The abundance of good places to eat in Dallas is one of the nicer things about the city. Eddie V’s and Bob’s Steak and Chop House are in a dead heat for steak, Maggiano’s for Italian but Grimaldi’s for pizza, then Chuy’s for Tex Mex. At Del Mar the Brigantine is a “must do” but I prefer places in the downtown plaza area like Pacifica Del Mar or Sbicca just down the street.